After Christmas’s Baroque extravagance of gold and red and tinsel and splendid carols and Messiahs are over, the simplicity of Michigan’s deep winter snows calms my spirits. 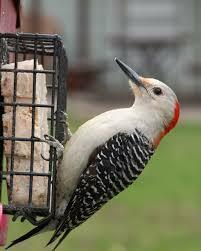 Suddenly, my birdfeeder becomes the busiest place in my quiet yard. Those of us who love nature to our very bones are discouraged to hear that climate change has already destroyed many bird species, and we are profoundly disheartened by apocalyptic prophesies of “mass extinctions,” not to mention “the death of nature” altogether. 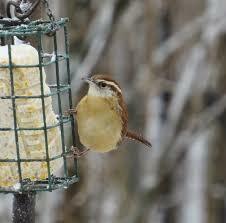 And then a Carolina Wren appears in the snow, a bird which does not belong in a Michigan winter. 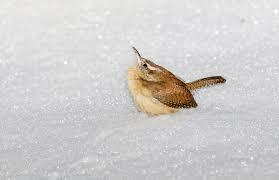 I check with my local Audubon Society – they have seen them for a couple of winters now; I look them up on the internet and discover that though Carolina Wrens feel the cold, our changes in temperature may account for what I am observing in Michigan, where the numbers of observations are up to 26% from just 8% 10 years ago. The Red-Bellied Woodpecker has become similarly widespread beyond its original southern range, where it had been on the decline, and I remember when we first saw Cardinals move north in the same way. It seems, too, that we will not always see ubiquitous White-Breasted Nuthatches at our feeders, the National Audubon Society having predicted a northern shift in their range. They have established a climate watch for Citizen Scientists this winter and spring to document nuthatch and bluebird locations. 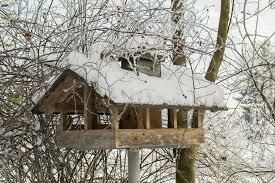 It seems to me that these new birds of winter, demonstrate an encouraging adaption to climate change. When we think of Darwinian mutation, the process of gene modification over a lengthy series of adaptions, it wouldn’t seem that any species would have time to save itself from global warming. My sightings at my backyard feeder having raised my hopes, I am thinking a lot about species adaption this winter and plan a series of blogs on the subject, looking for further signs of hope that we human beings can mitigate or even survive what we have done to our beloved planet.